When scientists plan to build a new particle detector, they run simulations to get a picture of what the particle interactions will look like. After constructing and starting up the real thing, they expect a period of tuning, adjusting, fiddling and fixing to get things running smoothly. They normally don’t expect to turn the detector on and see particle tracks of a quality that exceeds their idealized simulations, especially when it is a prototype detector. The Deep Underground Neutrino Experiment (DUNE) is an international endeavor to unlock the mysteries of particles called neutrinos, which could hold the key to one of the biggest unsolved mysteries in physics: why matter exists in the universe. While the DUNE detector modules ultimately will be 20 times larger, this first prototype detector, ProtoDUNE-SP, is still the largest liquid-argon neutrino detector ever brought to life — and a crucial step in making sure DUNE will work as expected. For Cavanna and hundreds of others from DUNE institutions in North America, Latin America, Europe and Asia, these exceptional results are the culmination of three years of hard work and fitful nights. In that short stretch of time, an international team of people had to coalesce; transform a chunk of land into an experimental facility; construct buildings, infrastructure and an enormous cryogenic container; and design and fabricate the pieces for a house-sized detector that would be assembled inside of that container like a ship in a bottle. In December 2015, Cavanna was in Japan for work. One night, he received a call from Fermilab’s director asking if he would like to be a coordinator on a new detector. Only a few things at the time were certain, Cavanna said. Second, while many institutions from around the world had formally signed on to participate in DUNE, a full-fledged scientific community dedicated to ProtoDUNE had yet to be identified and organized — and was essential to building a detector of such huge size and scope. Of course, ProtoDUNE-SP is not the first liquid-argon detector ever constructed. 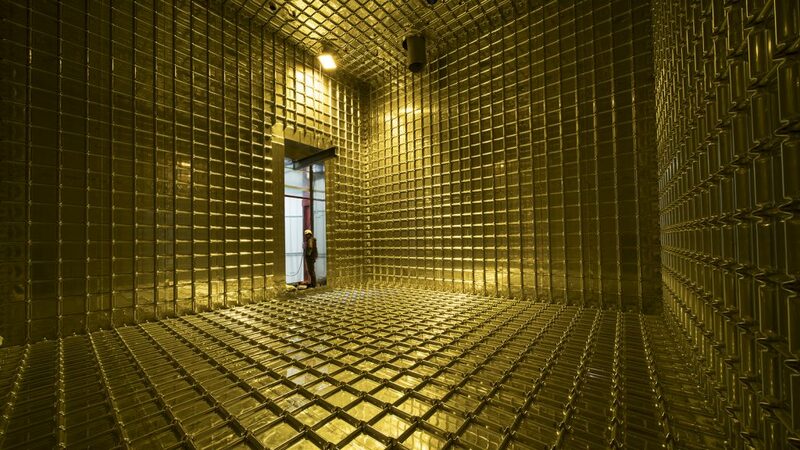 The technology was pioneered at the large scale for the ICARUS detector, which ran from 2010 to 2013 at the Italian National Institute of Nuclear Physics’s Gran Sasso National Laboratory under the leadership of Nobel laureate Carlo Rubbia. The team could also look to other liquid-argon experiments, such as MicroBooNE and LArIAT at Fermilab. Pieces of ProtoDUNE-SP began flowing in from around the world. Researchers from the Physical Sciences Lab at the University of Wisconsin-Madison sent the first of six crucial components called anode plane assemblies, special panels of wire that record particle interactions. On July 14, 2017, Cavanna sat in front of that very large APA shipping box at CERN and wondered how they would produce, test and install five more before their stringent deadline just a bit more than a year ahead. The teams went into high gear. Detector parts came faster and faster. Shipments of APAs from Wisconsin and a group of universities supported by the UK Science and Technology Facilities Council arrived. 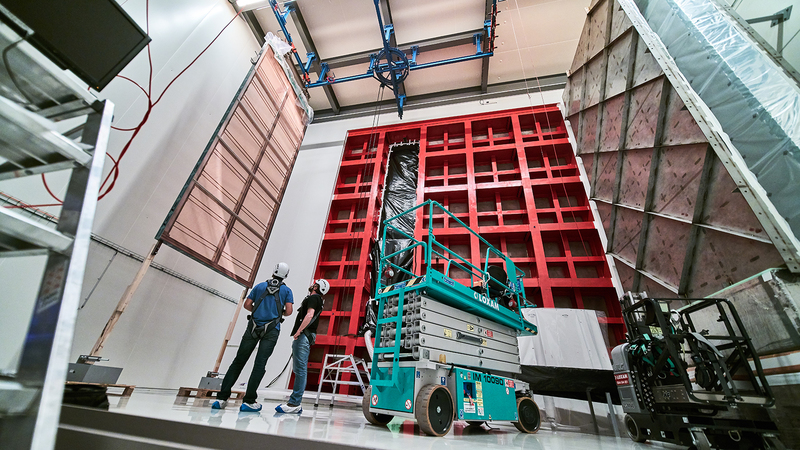 Teams tested detector components, then slid them through a narrow opening in the steel structure to an inner space where only a few people could work at a time. Fragile photosensors were added into the APAs. Electronics came together, cables were strung, and soon the temporary entrance in the side of the container was welded shut. To complete the final installation, technicians slid into the detector through a one-meter diameter manhole in the roof. 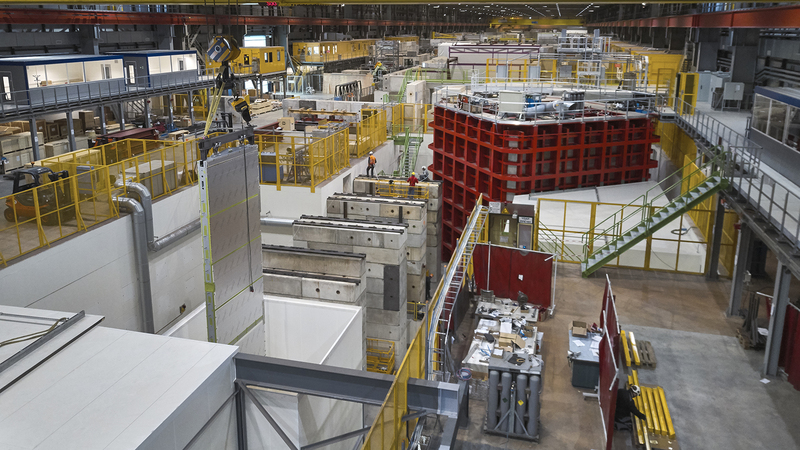 CERN’s cryogenic experts filled the detector with 800 metric tons of liquid argon and turned on the purifiers, letting the detector cycle the clear liquid and remove any stray bits of nonargon material. The components within were cut off from any rescue should something go wrong. When the filling was completed almost eight weeks later, ProtoDUNE scientists checked the equipment. CERN’s particle accelerator operators sent streams of protons toward the detector, and researchers turned up the power on the high-voltage system. Current flowed through the high-voltage system at a whopping 180,000 volts — exactly what it was supposed to do, “like it would be written in a textbook,” Cavanna said. Particle tracks showed up on the display, and soon after, celebratory champagne flowed in the ProtoDUNE control room at CERN. People around the world toasted their victory over video connections. When you have limited beam time, every second counts. Particles from the accelerator bombarded the ProtoDUNE detector 24 hours a day, seven days a week, but the deadline for shutting down the beam to prepare for a two-year-long upgrade to the CERN accelerator complex loomed large. After beam and detector tuning, between Oct. 2 and Nov. 12, ProtoDUNE-SP researchers collected more than 4 million gorgeous images of particle interactions. Members from participating institutions took shifts in the control rooms to make sure systems were operating as they should and watched the data roll in. “This is the first time we have had a live, 3-D event display for a liquid-argon detector,” said Tingjun Yang, co-convener for the data reconstruction and analysis group. Starting with the software used for the data analysis of another neutrino experiment, MicroBooNE, multiple groups collaborated to create a package to convert live data into the right format for quick, 3-D images that researchers on shift could use to monitor the detector. Over the course of the run, researchers collected data about all sorts of different particles that might come out of a neutrino interaction in a detector: pions, kaons, photons, electrons, protons and more. Because ProtoDUNE-SP sits on Earth’s surface, it also sees a high number of cosmic rays that the final DUNE detector won’t see from its mile-deep home at the Sanford Underground Research Facility in South Dakota. “It makes ProtoDUNE a great stress test for the detector and reconstruction capability,” Yang said. If the software tested at ProtoDUNE can handle the high number of particle interactions, it will be almost overqualified for the more serene environment of DUNE. Fermilab’s accelerator complex will send trillions of neutrinos through 800 miles of earth, but the far detectors will see only a handful every day. However, ProtoDUNE-SP’s robust data handling capabilities are needed to search for rare subatomic phenomena, such as the hypothesized decay of protons. It also ensures that DUNE can handle thousands of neutrino interactions in a few seconds if, say, a star explodes in the Milky Way. ProtoDUNE-SP also collected particles at the full range of energies DUNE expects to see: from 1 to 7 gigaelectronvolts (GeV). In fact, data-taking went so smoothly at these planned energies that researchers even had extra time to capture lower-energy particles, from 0.3 GeV up to 1 GeV. With precise control over the beam, scientists were able to carefully study how particles interact with the argon atoms — important physics studies in their own right — and test the detector components within. There is plenty still to do, Acciarri notes. DUNE will run for decades, so researchers aim to operate the prototype for as long as possible to monitor how the pieces of the detector fare over time. There also are plans for a series of tests on all the subsystems: things like the light detection system, electronics and high-voltage system. They plan to test their models of fluid dynamics, seeing how the argon circulates in the detector, and how each subsystem affects the others. Two consortia are already working on improvements for the crucial anode plane assemblies for DUNE. On the software side, researchers will work to improve the stability of the system and the speed at which it captures events. And scientists are working to complete a second ProtoDUNE detector at CERN, known as the dual-phase ProtoDUNE. DUNE already has around 1,000 members from more than 30 countries and continues to grow. With all the ongoing planning, construction and testing taking place around the world, the team of DUNE scientists and engineers, it seems, will have a busy and collaborative 2019.